What if I told you that searing that steak doesn't hold in the juices? Neither does setting aside the fork in favor of the spatula. Is mayonnaise a sea of bacteria waiting to ruin your cookout? Should you spray down that flare-up? 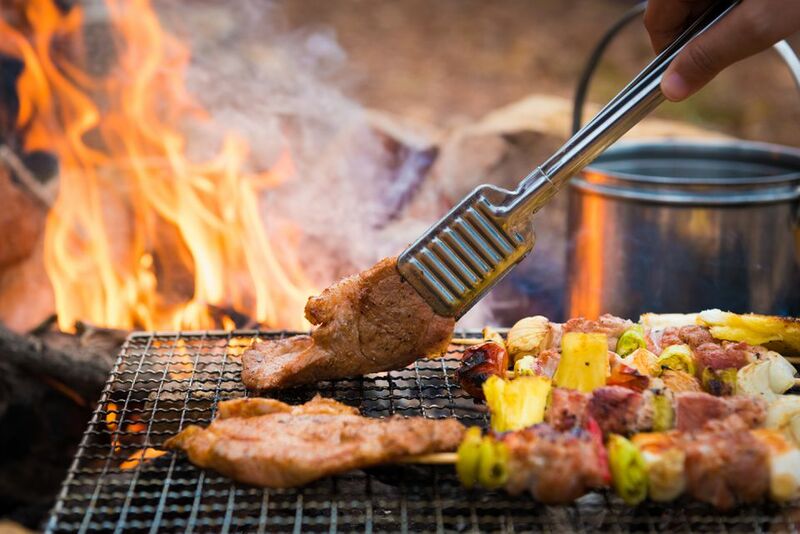 There are a lot of myths out there in the barbecue and grilling world and some of them are preventing you from being the best cook you can be. Let's debunk those myths and get cooking. It seems reasonable. Get that grill as hot as it will go and throw on a steak to sear in the juices. With the surface of the steak cooked hot and fast the juices will stay inside. Right? Wrong. The moisture in meats is inside the individual cells, not floating around like in some kind of balloon. Heat causes these cells to contract draining juices from the meat and to cause it to get dry. The more you cook the dryer the meat will get. High-temperature searing won't affect the moisture of the meat. What it does do is brown the surface of the meat in processes known as caramelization and the Maillard reaction. These processes affect amino acids and sugars on the meat giving it that rich, sweet flavor. So sear for the flavor, not the juices. Everyone who knows anything about food and cooking jumps up to tell you that marinades don't work, or at least they do little to improve the qualities meats before you cook them. This is based on the myth that marinades can sink deep into the meat, tenderizing and flavoring as they go. Of course, the only way a marinade can tenderize to the center of any cut of meat is by literally dissolving it. The reason to marinate isn't too fundamentally change a piece of meat. An acidic and oily marinades protect meats from the intense heat of the grill, reducing the formation of cancer-causing substances. For this alone, marinating is worth every minute. But there are other reasons as well. While marinades won't turn the toughest cut of beef into Filet Mignon, it reduce how much it will dry out while cooking, and thus make it more tender. Marinades also add flavor and allow you to stick seasonings to the surface. Flare-ups are grease fires. You don't put water on a grease fire. Spraying your flare-up with water will spread out the grease. While it might put it out for a minute the grease will fire up again and you will now have a larger grease fire spread over a larger area of your grill. Reducing the fat in the first place will reduce your risk of flare-ups. When a flare-up does occur, open up the lid, move the food out of the way and wait for the flare-up to subside. If you have a flare-up on a charcoal grill, close the vents and put the fire out ​by eliminating the oxygen. Don't fight flare-ups, control them. You should be gentle with the things you cook. This is true. Though flipping meat over several times isn't a bad thing. You want even cooking or you are going to get something overcooked on one side and raw on the other. You accomplish this by turning and flipping. So flip frequently, but flip gently. If you've eaten salted pork then you know how dry this can by. Actually salting meats used to be a way of preserving foods before the days of refrigeration. Perhaps this is the origin of the myth that putting salt on meats before you cook it will cause it to dry out. The truth is that the only thing salt on a raw steak will do is make it taste better when it is cooked. So salt away and don't worry about the dry meat. Mayonnaise is made by whipping eggs with oil. Commercial mayonnaise is made with other ingredients like acids and preservatives. Mayonnaise has a very low pH and isn't a good environment for bacteria to grow in. Chances are if your potato salad goes bad it was bacteria on the vegetables (or your hands) that are the culprit. Now, don't get me wrong. I am not saying that you can keep your mayonnaise items sitting in the sun all day. All I am saying is that it probably wasn't the mayo. Keep it cool until you eat is always the RULE. Under no circumstance should you touch a piece of meat with a sharp, pointy tool (it might pop). Poking holes in meat will let the juices drain out causing it to dry out. This would be true if (like I said above), a piece of meat was like a balloon. Yet we have all been told that if you poke a hole in meat that the juices will run out. I once knew an excellent cook who insisted that you should never squeeze up a steak with a pair of tongs because like wringing a sponge you will squeeze out the juices. Since meat is made of millions of little balloons, to keep the meat moist you need to keep the moisture in these little balloons. The truth is you should be gentle with whatever you cook. Grills these days are all about the heat. The promise of incredible temperatures seems to be the biggest marketing hook in the industry. The truth is that a good grill can do a wide range of temperatures, not just hot. Meats and vegetables should be cooked at different temperatures. While you might want that steak or hamburger done as quick as possible, chicken needs a lower temperature to prevent it from burning and fish needs even a lower temperature to keep it together and to prevent it from drying out. Learning how to use your grill is learning how to control the temperature. Crank up the heat, let it go for about 10 minutes, give the grates a quick brush and your grill is clean, right? Wrong. Would you clean your pots and pans this way? Grills, whether gas or charcoal need to be cleaned regularly. This means getting inside the grill and cleaning out all the parts. A clean grill cooks better, has fewer flare-ups and lasts longer. Don't believe that just because you killed off the germs with a dose of high temperature that your grill is clean enough to cook on. All the recipes say it. Soak bamboo skewers in cold water for 30 minutes to prevent them from catching fire on the grill. Now think about it. The amount of water that a bamboo skewer can hold after soaking probably won't fill a thimble. This is hardly enough water to keep them from catching fire and any water they do hold will evaporate in a matter of seconds. To prevent bamboo skewers from burning to try placing a piece of aluminum foil under the ends to protect them. Also, the rule for skewers is metal for high heat items like beef and lamb, bamboo for lower temperature cooking like shrimp and seafood.